I love my iPhone Life Magazine App! I use my iPhone Life app all the time. It has worked and continues to work quite well for me, on any iDevice I own, though my favorite way to view the magazine is on my larger iPad. 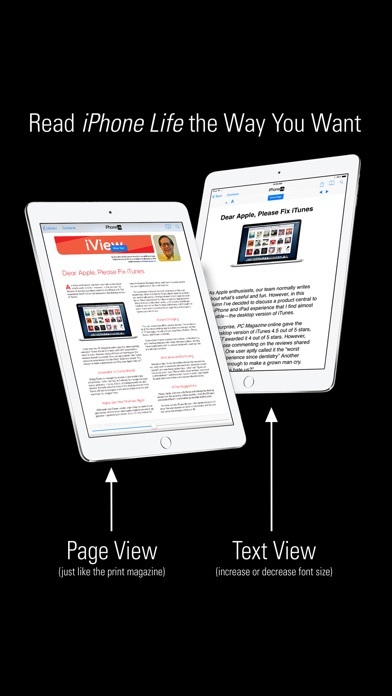 Whether keeping up with all the latest Apple news and product updates or finding out about all the latest awesome apps and gear, iPhone Life is where I get the majority if my Apple iDevice news. 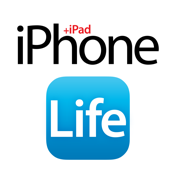 iPhone Life is one of the best sources for iDevice related current event info and news. I highly recommend it and would suggest anyone who appreciates good writing and the Apple brand do them selves a favor and check out the app. I also subscribe to the iPhone Life newsletter and find that to be a great way to get timely weekly updates on all things iOS in my inbox. Good magazine, but EVERY timeI try to read the "news" section (on my iPad, iPhone, and iPad Mini), it closes the app. You'd think of all apps, these developers would have fixed this by now! I've been reading the magazine since it first came out. I was curious how it would be reading it on my iPad. It works well. I bought the current issue, their Buyers Guide, and found it a great convenience to be able to simply tap to immediately download an app that interests me. Same thing for the ads. You can click on the URL to get more information or buy the product. One of the ads even had an integrated video. I found the app navigation to be intuitive and responsive. Certainly it's very attractively done, and an exact replica of the magazine. Tapping the screen brings up a carousel of thumbnail images of the pages, so that you can quickly jump around in the magazine. A drop down menu gives you a table of contents. I wish there were a way to quickly jump back to the replica table of contents. It seems like that would have been the most intuitive, but that's probably simply because I'm so acclimated to reading print magazines. Overall, it's very professionally done, and a great option for reading the magazine. Downloaded app. Paid for subscription, then was redirected to another app named Zinio, which required me to register separately, but does not recognize my paid subscription. Even the iPhone Life app still wants me to make in-app purchases for each issue. What a joke! How can they claim to represent Apple's philosophy of elegant user experience. Let my story keep you from wasting $12 and thirty minutes of your life. UPDATE: I downgraded from 2 stars to one. The Zinio app doesn't even offer iPhone Life. The only way I can see my digital subscription is to click on the link in an email I get from Zinio on behalf of iPhone Life. KEEP YOUR SANITY. DO NOT SUBSCRIBE TO ANYTHING OTHER THAN THE PRINTED VERSION DELIVERED BY SNAIL MAIL. Love the magazine, and I like how the digital issues came along with my print subscription. Love having the ability to read my favorite Mag while on the go! 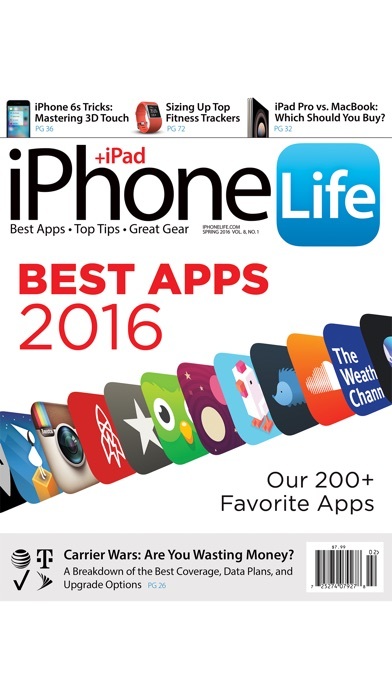 Great magazine, all the best info about iPhone, iPad. The best apps, accessories, and tips! I love the magazine. I read every issue cover to cover. Also really liked the new RSS feed. Love the magazine. But how can you read it offline? It downloads but when wifi off can't open the magazine. Please advise. Pointless having a magazine you can't read offline when traveling. I constantly get a "service unavailable" message. You would think a magazine app dedicated to iPhone/iPad issues function better. Btw, I have no issues downloading other magazines from other apps. Don't seem to be working on my phone after update. Please fix. I bought the subscription for one year and still have to pay for the issues indiVidually, I mean, seriously? What is the subscription for then, if u guys r going to charge me for Tha issues? Just like everything else here it's NOT free. Waste of time to get anything in the newsstand section. Say there free but after download you have buy. Zero stars if I could!!! This is one magazine that gives techies and non techie current and informative on all things technology related. A must have for anyone. I love their content, very interesting and informative! 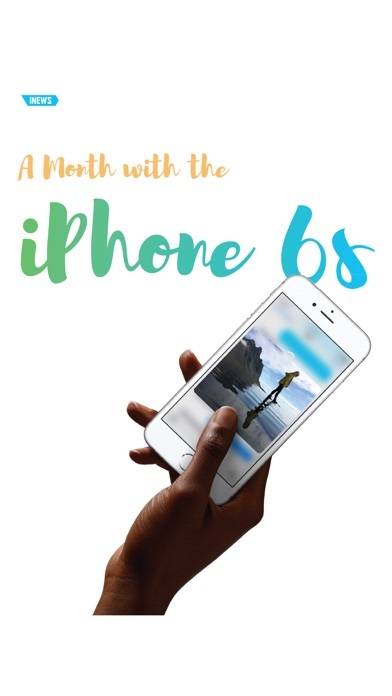 For real?....a magazine that's all about iPhones and you haven't even updated your mag to fit the full height of the iPhone 5 yet???!!!.....really? 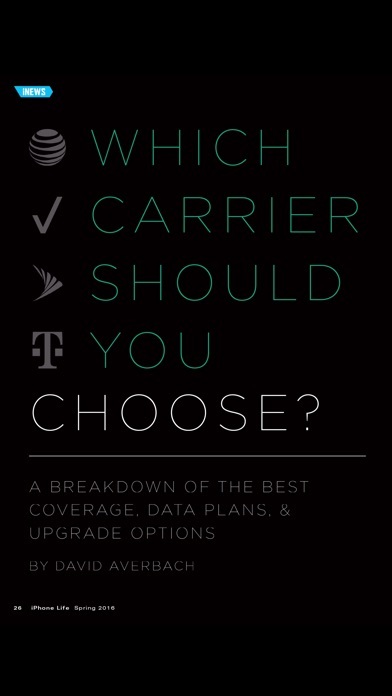 most comprehensive and most focused source for iphone info. Really informative, I learned a few cool tricks I didn't know about. Won't resize to fit screen. Horrible app. Type is too small to read. When you double tap to enlarge, it expands beyond the screen size. You have to slide the page back and forth to read an article. You get dizzy reading. In short, this iPhone magazine app doesn't work on an iPhone. Very good magazine! Subscription prices kinda high but overall pretty good! It might be a great app/magazine, but it is "NOT FREE"
Should have listened to others!!!! Bad!!! 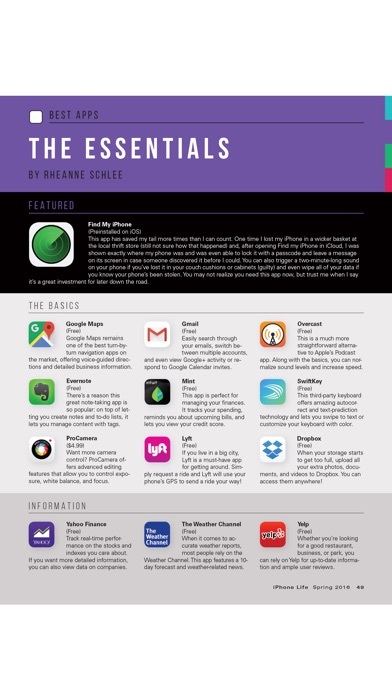 iPhone Life magazine offers an entertaining way to find out all the ways you can use your iPhone and iPad to make your life better. This is just wrong. I was reading their website and they suggested I read the article via their app - not possible. I guess I just continue reading the copies at the book store section of the supermarket. Beautiful Piece of Equipment.. A Gem for Sure.. The World in My Hand.. And With the Tech Support Team, at Apple, I am very please.. With the ease..
Crashes every time you open news. I like the update to the app. Purchased the 12.99 subscription. Hasn't worked yet. Email the company and all they give me is excuses and their working on the problem. Was just told to update app and all would be good. Still doesn't work. Have asked for a refund twice and they don't want to refund my money. DO NOT PURCHASE OR EVEN DOWNLOAD THIS USLESS APP. once they have your money they could care less. I WANT MY REFUND MR DEVELOPER!!!!!!! Stand behind your product! Trying to give it a one star rating and it doesn't even let me do that. I imagine if I press on the 5thnstar rather than the first it would register then. TOTAL SCAM!!!!!!! Cool app. Good articles about related products and rumors of upcoming devices. Needs an update for the bigger screen though! Unbelievable that this app still uses the iPhone 4 format and does not utilize the extra space on the 5. Very Poor. With No iphone 5 support?? The latest iOS7 update has a text reader built in that makes it easier to read all the articles. As someone who often reads from the iPhone, the feature was badly needed. Thanks! This a most informative and enlightening magazine. I will buy it again, the app, however, is ok but it is quite buggy, ie. freezes every time an add loads, freezes when if I zoom on a page to read it, then back out. Would love if if they could get all the bugs out, this would be an amazing app.